Dharamshala is a very beautiful and popular destination to visit with family, individual or corporates. Dharamshalais the second winter capital of the Indian state of Himachal Pradesh and a municipal corporation in Kangra district. It also serves as the district headquarters. It was formerly known as Bhagsu. The Dalai Lama’s residence and the headquarters of Central Tibetan Administration (the Tibetan government in exile) are in Dharamshala. 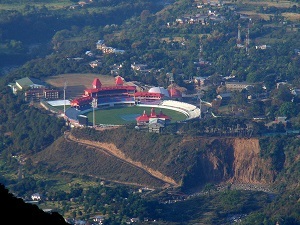 Dharamshala is 18 kilometers from Kangra. On 19 January 2017, Chief Minister Virbhadra Singh declared Dharamshala as the second capital of Himachal Pradesh state, making Himachal Pradesh the third state of India with two capitals after Jammu and Kashmir and Maharashtra. The village of McLeodGanj, lying in the upper reaches, is known worldwide for the presence of the Dalai Lama. On 29 April 1959, the 14th Dalai Lama (Tenzin Gyatso) established the Tibetan exile administration in the north Indian hill station of Mussoorie. In May 1960, the Central Tibetan Administration (CTA) was moved to Dharamshala. Dharamshala is the centre of the Tibetan exile world in India. Following the 1959 Tibetan uprising there was an influx of Tibetan refugees who followed the 14th Dalai Lama. His presence and the Tibetan population have made Dharamshala a popular destination for Indian and foreign tourists, including students studying Tibet. One of the main attractions of Dharamshala is Triund hill. Jewel of Dharamshala, Triund is a one-day trek at the upper reaches of McLeod Ganj, about 9 km from McLeod Ganj. 1. AC Innova taxi service from Chandigarh to Dharamshala and vice-versa. 2. AC Etios taxi service from Chandigarh to Dharamshala and vice-versa. 3. AC Indigo taxi service from Chandigarh to Dharamshala and vice-versa. 4. AC taxi from Chandigarh to Dharamshala and vice-versa. 5. AC Tempo Travellers from Dharamshala to Delhi and vice-versa. 6. AC taxi from Chandigarh to Dharamshala Kullu Manali Amritsar and vice-versa. If you are intrested in Paragliding and camping as individual or in Group,We also make packages for paragliding in Bir-Billing.This is the famous place 70 kms away from Dharamshala.